When it comes to building things, Eric Loth has his head in the clouds. This engineering professor at the University of Virginia wants to construct a wind turbine standing more than five times higher than the Statue of Liberty, with rotor blades longer than the Washington Monument is tall. Not only that, the 1,650-foot-high mega-turbine would change along with the weather, bending its blades gracefully to cope with hurricane-strength winds. And all of this would happen dozens of miles out at sea. Typical wind turbines are about 80 meters, or 260 feet, in height. Why build one so big? In 2000, there were just a handful of utility-scale turbines. Today, more than 52,000 generate about 6 percent of the nation’s electricity. The growth of wind power is accelerating (see graph below); it accounts for more than two-thirds of all the renewable energy capacity installed in America since 2008. And wind turbine technician is one of America’s fastest-growing occupations. But ousting natural gas as the nation’s most popular source of electricity will take turbines that are cheaper still. And that means looking up — way up. The U.S. National Renewable Energy Laboratory estimates that raising the height of wind turbines from 80 to 140 meters would almost double the land area across the country where wind power is cost-effective. Loth wants to go higher yet. He envisions 500-meter towers capable of generating 50 megawatts (MW) — roughly six times more electrical power than today’s largest turbines can pump out. This is uncharted territory for wind power. One problem is that building bigger versions of the turbines you see on hillsides today simply isn’t feasible. Rotor blades tend to flex in high winds, raising the possibility that the rotors would strike the tower supporting them. Taller wind turbines will need stiffer blades positioned well away from the tower — which adds weight and cost. Loth’s solution? Locate the blades not upwind from the tower — as is standard with today’s designs — but downwind instead. That way, high winds would cause the blades to flex away from the tower rather than toward it. Loth also wants to create blades that change in response to the wind. His mega-turbine rotors would be hinged at their base, allowing them to flex with the wind instead of fighting against it. That, together with the use of high-tech materials like carbon fiber, should enable the skyscraper-sized blades Loth requires. “We’re also looking at ways to 3D print the blades, allowing much more novel shapes and geometries,” he says. Wind turbines with downwind blades have been tried before. In the late 1970s, the U.S. Department of Energy (DOE) installed a large downwind turbine on a hill in Boone, North Carolina. Though the turbine operated more or less successfully for several years, the design caused annoying whooshing and thumping noises that rattled the occupants of nearby homes. Loth plans to build a small prototype downwind turbine next summer, using a $3.7-million award from DOE. If that’s successful, he hopes to raise money for a larger demonstration model and eventually to commercialize his 50MW mega-turbine, which he estimates could cut the cost of wind power in half. “But I wouldn’t expect to see our turbines out there in the marketplace for maybe 10 years,” says Loth. Not all wind power researchers want to wait that long. Eric Smith, CEO of the Cambridge, Massachusetts-based Keystone Tower Systems, has a wind technology that he thinks is almost ready for prime time. One big obstacle standing in the way of bigger wind turbines is the high cost of building them. The largest turbines now in use require towers that are wider than the standard gaps beneath highway overpasses. That means wind farm operators cannot simply truck in modular tower sections. Smith says he’s developed a way of modifying the continuous welding technologies used to lay long-distance oil pipes to produce the tapered shape necessary for turbine towers right on site. “We can produce a tower using about a tenth of the labor per ton of a conventional tower factory — instead of 200 workers, we can have a 20-person crew,” says Smith. Keystone has used this approach to build a small tower and is now working with established wind companies on larger designs. Smith calculates that his spiral welding technique could be scaled up to produce large steel towers 40 percent lighter than standard towers. That, in turn, might lower the overall cost of wind energy by 10 percent. Either way, bigger wind turbines are on the horizon — which is exactly where some people would prefer them to remain. “While people are interested in renewable energy, if they start to perceive it as a monstrosity in their backyard, it can temper their enthusiasm,” Loth says. His plan is to situate his mega-turbines not on land but 25 miles or more out to sea. 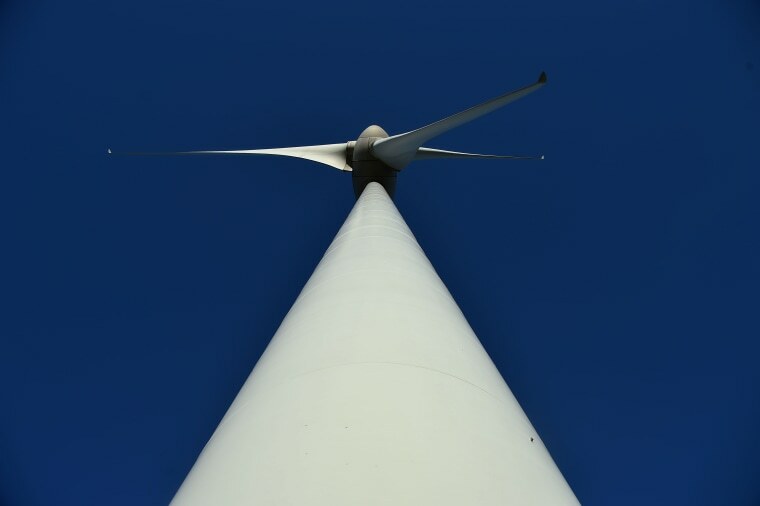 In addition to dispensing with noise (and disgruntled neighbors), that would put the turbines smack in the middle of some of the planet’s strongest winds. Of course, strong winds increase the risk to the wind turbines as they lower the cost of wind-generated electricity. For now, the biggest threat to Loth’s mega-turbines is not the weather but the ever-shifting political climate. Under President Trump, DOE looks likely to focus on coal and other fossil fuels from wind and other renewable sources of energy. But with wind turbines already competing with fossil fuels on cost in some locations, this is a technology with the wind at its back.